Alla SANNIKOVA began her circus career in the Cleo Dorothy Illusionary Attractions company, from 1954 to 1959. Following her marriage to Igor Sannikov in 1959, she began working as a dancer in the Mikhail Kachuriner Musical-Eccentric ensemble where she remained until 1980. 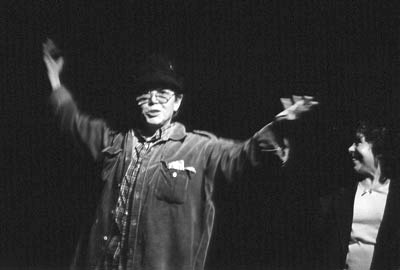 Her work in theater began in 1989 with two shows: Boris Lvov-Anokhin?s production of Hollywood Tales at the Maly Theater and Roman Viktyuk?s production of Edvard Radzinsky?s play Our Decameron at the Yermolova Theater. As a member of the cast of Snow White and the Seven Dwarves, she performed for four months in Oslo, Norway, at the Viktoria Theater and continued performances of this show on tour in Germany from 1993 to 1995. She was again invited by Lvov-Anokhin to perform in The Novellas of Margaret of Navarre, this time at the Novy Drama Theater (1996). Her film and TV credits include the films A Nasty Anecdote (1964), The Scarlet Flower (1991), Kotovasiya (1997) and Drakosha (2000). She performs the role of Rocinante, who is also Don Quixote?s guardian angel, in Quixote and Sancho.